Warning: I will close the bug issue without the minimal init.vim and the reproduce ways. This error prevents me from doing step 3. I'm following the installation instructions specified in the Readme with the exception that I have put the config file in ~/.config/nvim/init.vim. Happy to provide more information if needed. If so, let me know! OS: new MacBookPro with MacOS 10.13.4. It is not dein.vim error. It should be reported in neovim issues. But your neovim is old. Please test the latest version of neovim. Ok. Thanks. Tough to tell when it only seems to break with Dein, but I haven't fully tested neovim yet either. 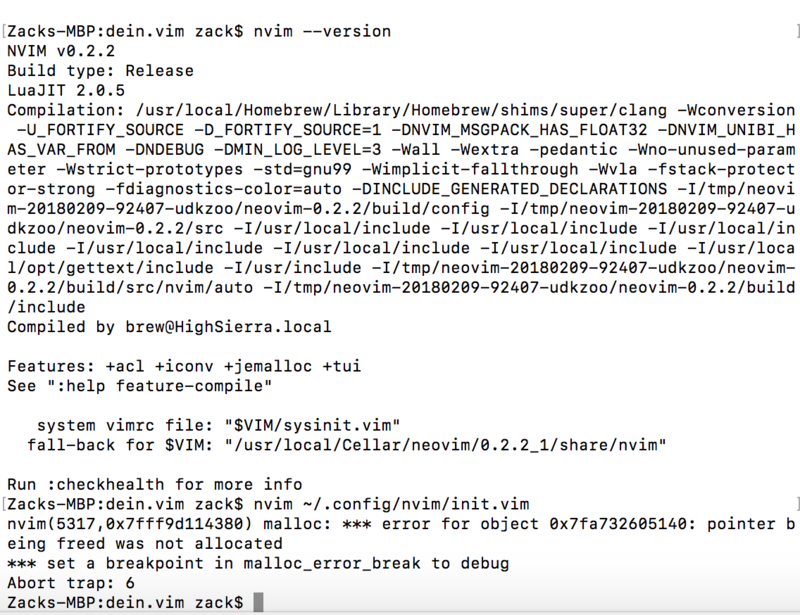 Also, what makes you say that it is an old version of neovim? Their website (https://neovim.io) says that 0.2.2 is the latest version. It's also the latest version on Homebrew. I'm curious what I am missing. Are your referring to it not being the latest unstable version?